The Toolmaster Heavy Duty Staple Gun is perfect for the home or shop. Features an ergonomic rubber handle for comfort, handy tacker function and durable aluminum construction. Pearl finish. Includes 500 (14mm) staples. Arrow's professional grade heavy-duty staple gun. This staple gun features all-steel construction, patented jam-proof mechanism, visual refill window, and shoots 6 sizes of T50 staples. With its easy squeeze operation, the T50 can help you perform any job, from insulation to upholstery to light wiring. The Lincoln Electric Magnum PRO 100SG spool gun is the lowest cost way to add reliable and precise wire feeding performance for soft aluminum wire. Its easy to set up for occasional and experienced welders on Lincoln Electric compact wire feeder/welders. Key features include : Premium Magnum<sup></sup> PRO Expendables Copper Plus contact tips and long-life diffusers with Anti-Seize threads. A lightweight accessory at only 3.5 lbs. (1.6 kg). For all aluminum alloys; Recommended wire diameters can be fed with the same drive roll and liner assembly. Built with an ergonomic grip and full travel mechanical trigger. 10 ft. (3.0 m) gun cable offers fast connections to the welding machine. No expensive gun or bulky adapter module. Comes with a sturdy carrying case, which protects the gun during transport and storage. The M12 Cordless Grease Gun develops higher pressure, offers greater productivity, and gives the user more versatility on the jobsite than any other cordless grease gun in the market. With up to 25% more pressure and run-time than the competition, the 2446-21XC delivers over 8,000 PSI max operating pressure for heavy duty applications and dispenses up to seven grease cartridges per battery charge. The 2446-21XC also features a lightweight, ergonomic handle design for greater user comfort during prolonged use and an on board hose storage and shoulder strap loop for added convenience with less mess. The M12 Cordless LITHIUM-ION Grease Gun develops higher pressure, offers greater productivity, and gives the user more versatility on the jobsite than any other cordless grease gun in the market. With up to 25% more pressure and run-time than the competition, the 2446-21XC delivers over 8,000 PSI max operating pressure for heavy duty applications and dispenses up to seven grease cartridges per battery charge. The M12 Cordless LITHIUM-ION Grease Gun also features a lightweight, ergonomic handle design for greater user comfort during prolonged use and an on board hose storage and shoulder strap loop for added convenience with less mess. 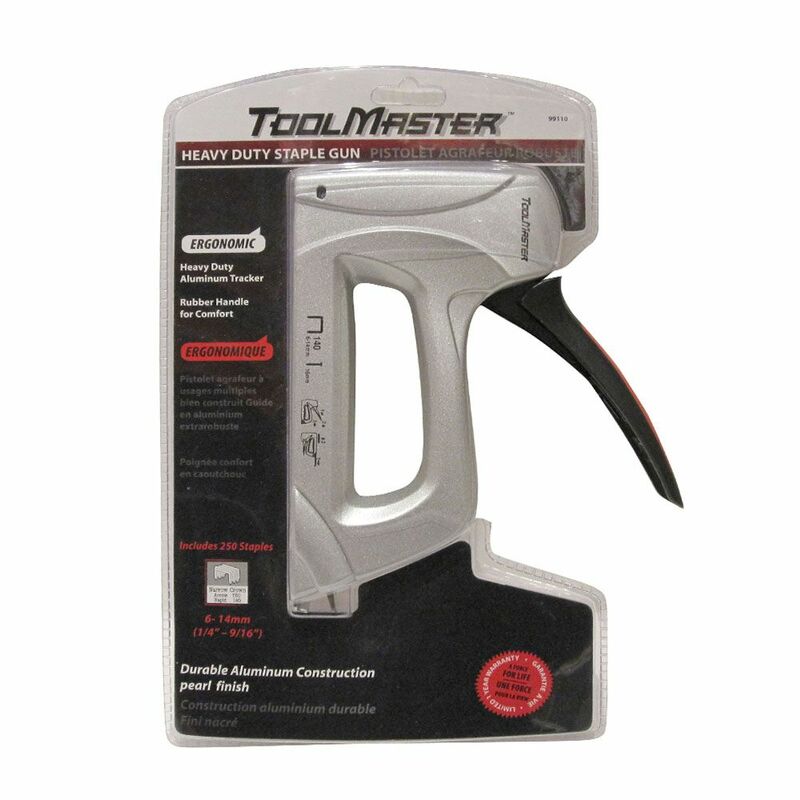 Heavy Duty Staple Gun The Toolmaster Heavy Duty Staple Gun is perfect for the home or shop. Features an ergonomic rubber handle for comfort, handy tacker function and durable aluminum construction. Pearl finish. Includes 500 (14mm) staples. Heavy Duty Staple Gun is rated 5.0 out of 5 by 1. Rated 5 out of 5 by Rolo from Very easy to use & effective One of the easiest and most effective staple gun I’ve used. Recommend it!